Recent release “Three Tales with Tails” from Page Publishing author Liz Burleigh is an endearing tale that shows the beauty and wonder of the animal kingdom. 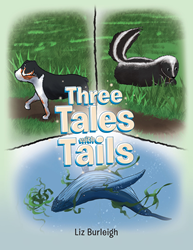 Liz Burleigh, a lover of animals and the natural environment, has completed her new book “Three Tales with Tails”: a heartwarming narrative of a whale, a dog, and a skunk in an exciting journey that speaks of joy, information, and adventure. Published by New York City-based Page Publishing, Liz Burleigh’s enthralling tale also conveys an advocacy of caring for the environment and understanding the nature of fauna to inspire compassion and knowledge about them. Readers who wish to experience this unique work can purchase “Three Tales with Tails” at bookstores everywhere, or online at the Apple iTunes store, Amazon, Google Play, or Barnes and Noble.